Chinaski's does not offer any booking services that we know. You can always contact them to check. 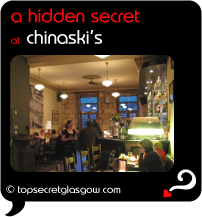 Chinaski's is almost hidden from view where the M8 slices through Glasgow city centre, It quite rightly has become a top spot with locals in the know. Maybe its the surprise, West-facing beer garden out back. Or maybe its the super range of cool gastro-pub food that draws them in time and again. The cool interior design makes for a snug, well cared for feel, while the soft background music and wild choice of bourbons set the scene for a very relaxed time. Great news! Finding this page means you can now join our VIP list for Chinaski's. Grab your very own web page all about Chinaski's. Do you have a special story about Chinaski's? A funny experience? A grand occasion? A funky photo? A personal tip? A top secret?